Scooper - Technology News: What do high performers want at work? It’s time we stopped lumping together high and low performers in workplace statistics, according to a study. The report by SAP and Oxford Economics suggests that high performers want different things to low performers across a range of categories. They are more satisfied in their jobs, but still likely to leave; and they care more about base pay and bonuses and desire more frequent feedback. How satisfied are high performers? As you might expect, high performers are generally more satisfied than lower performers. However the difference is only marginal, and over half remain unsatisfied. They are less likely to leave their jobs within the next six months. However, one in five are still considering leaving in that time period, compared to an average of one in four. What do high performers value at work? High performers are more concerned about base pay and bonuses than other employees, according to the report. Compensation strategies that do not differentiate based on performance are likely to alienate high performers, along with pay schemes based on length of service. Half of high performers are also keen for at least monthly feedback on their performance. However, only 53% of managers are delivering on these expectations. The report suggests that chronic failure to meet these expectations could result in high performers feeling underappreciated. Development and self-directed learning are also a high priority. These can take the form of formal training programmes, or even just managers providing clear information about what employees can learn from a task. 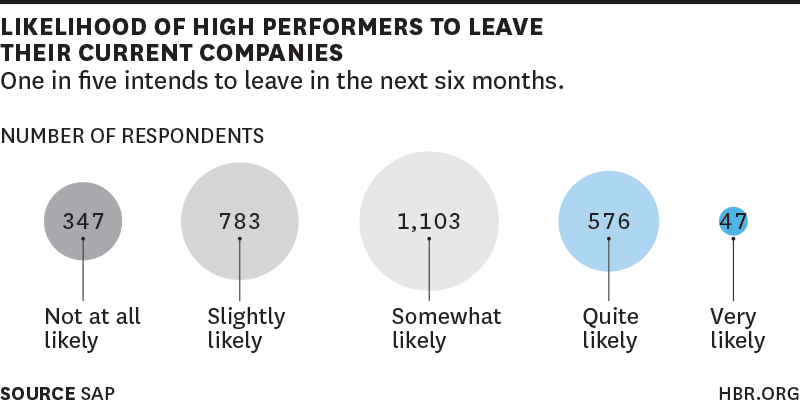 On the other side, high performers are less likely to relocate for a better job. Ultimately every business wants to keep their best performers. Understanding what they want and need is a vital step to a happy, productive workplace.